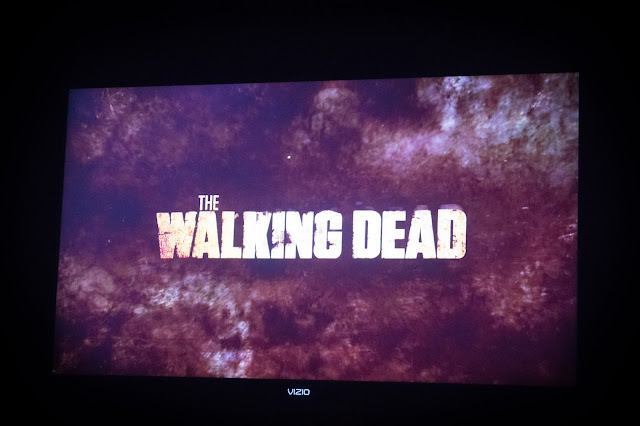 My husband is a HUGE fan of The Walking Dead Television Series on AMC. 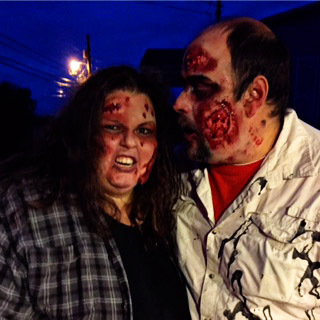 To be honest, my husband is a fan of zombie movies in general. So after the shocking revelation of Glen's (one of the original characters of the show) possible death, I knew I had to do something special for the mid-season finale. 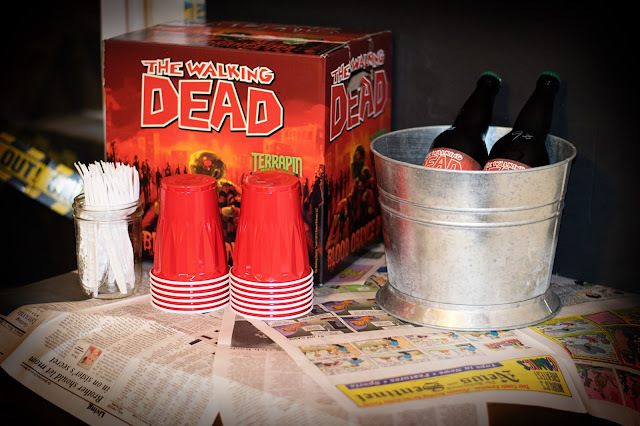 That is when I decided to throw a Walking Dead Dinner party for him and our zombie loving friends! Anytime you are wanting to throw a themed party, I think your first thoughts immediately go to the decorations and table setting. Since The Walking Dead is set in a post zombie apocalyptic world, I thought news papers, old cans, and rats. Instead of buying a fancy table cloth, I just covered my table in news paper (got from a friend). To add a little softness to it I also covered it with some webbing from The Dollar Tree (1.00). In preparation for this evenings festivities I had saved a few cans throughout the week, and placed them around the table as well (already had). Because it's a dinner party I wanted to add a little elegance to my table, so I used these candle sticks that I usually have in my fire place (already had). It added that dim light and softness I think the table needed. 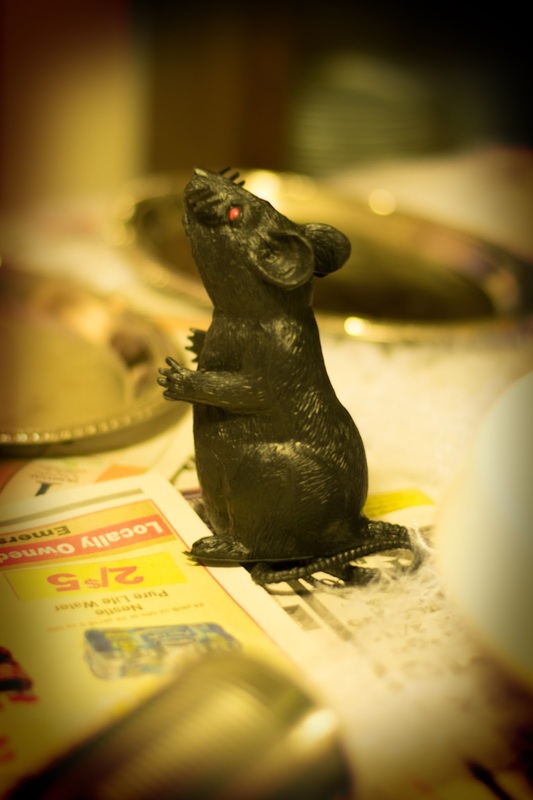 And we can't forget my little friends the rats! I picked these little guys up at The Dollar Tree as well (2.00). I might add that it just so happened to work in my favor that this party fell during Halloween holiday season, so I had access to all of this stuff. Now let's talk food! I was able to furnish all of the food, for 6 people, for $26 by using what I already had on hand and shopping at Aldi. Mixing everything together in a bowl until combined then mold into a ball. I simply took a chop stick and made a brain-like design in it. Again, to keep things classy, I served it on a silver platter and with these fun little toasts instead of crackers. It was a BIG hit. Next I served what I am calling a "Fleshy-Pasto" Platter with Zombie Eyes. This was basically a meat and cheese tray with olives. Aldi had this artisan assortment of deli meats that had a "fleshiness" to them that inspired the tray. I got the skeleton, which I thought added a nice touch, at The Dollar Tree (1.00). You can NEVER go wrong with a meat and cheese tray at a party. I had the "finger foods" covered, but since this was a little later in the evening, I needed a main course entree. While perusing the aisles at The Dollar Tree I saw this really fun skull and it reminded me that I had some spare ribs in my freezer. 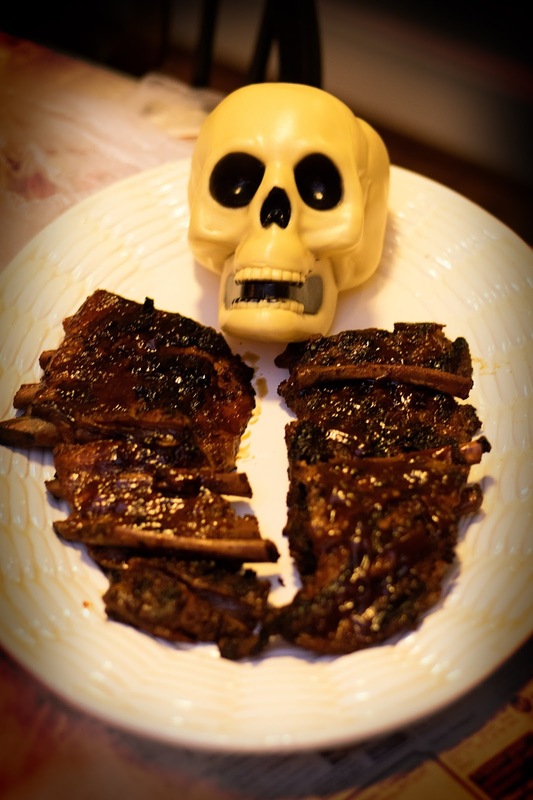 I INSTANTLY got the idea for this Rib Platter. It is delightfully gruesome, and it couldn't have been easier to make! Season the ribs with salt, pepper, and your favorite BBQ rub. Place in the crock pot with 1 sliced onion, brown sugar, and 1 c. of cola. Finish on grill and baste with your favorite BBQ sauce. Because it was Halloween Season, I found this cute little Zombie Cupcake Kit at Aldi and whipped it up for dessert. It was so simple and they were adorable! 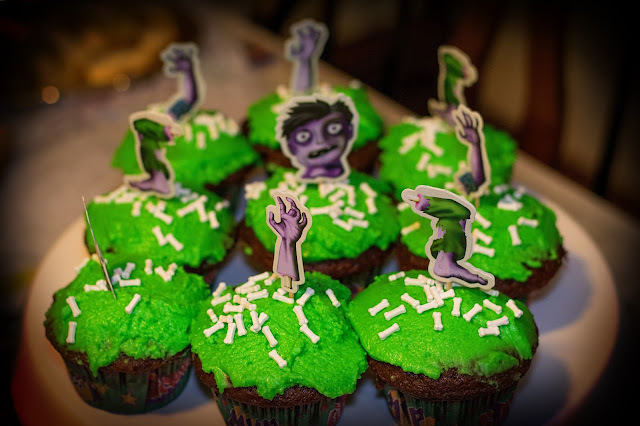 Well, as adorable as zombie cupcakes can be. One find that I unexpectedly came across was this Walking Dead Blood Orange IPA from a local wine shop called The Wine Basket. I purchased a few bottles and they were nice enough to throw in this really fun box for free! 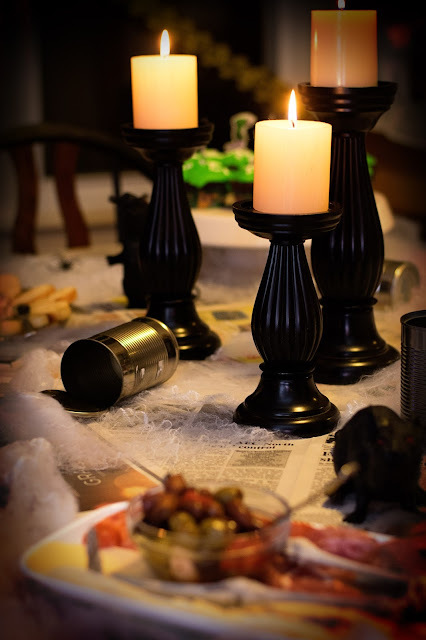 So now that the table was decorated, the food was ready, the beverages were chilled, it was time to get into character. I mean, you can't have a Walking Dead Dinner Party without zombies! For $10 Studhubs bought this fun zombie make-up kit from one of the Halloween stores in town, and I have to say he ROCKED IT! This is not normally a look I would go for, but I have to admit it was a lot of fun. Well, everything and everyone is ready! It's time for the show to start! I wonder if we will find out the fate of poor Glen tonight! 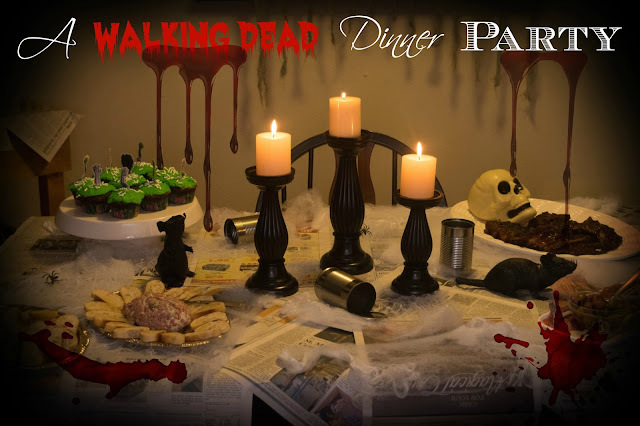 I hope y'all enjoyed all of these fun ideas for this Walking Dead Dinner Party, and are inspired to maybe throw one of your own! 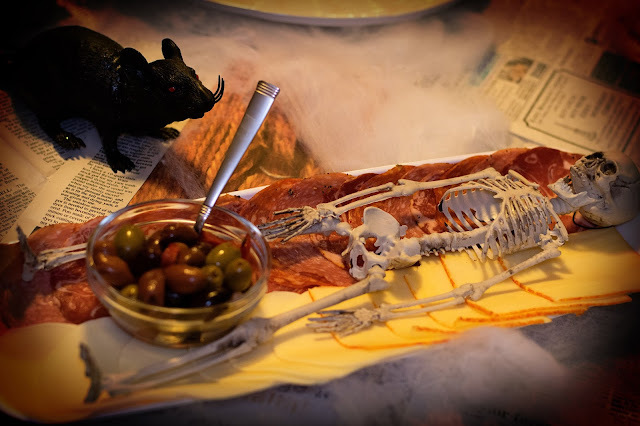 You planned for just a perfect Halloween dinner party. 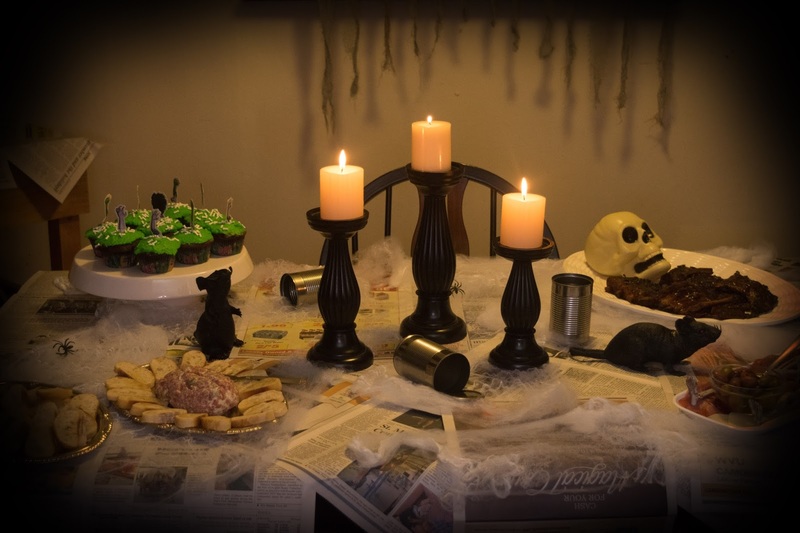 I had used few of these ideas for my party at event space San Francisco this Halloween and my guests loved that. I was really happy. Hi there! I am not sure how your comment slipped through my radar, but thank you so much for stopping by! And thank you for your sweet comments! Very nice! 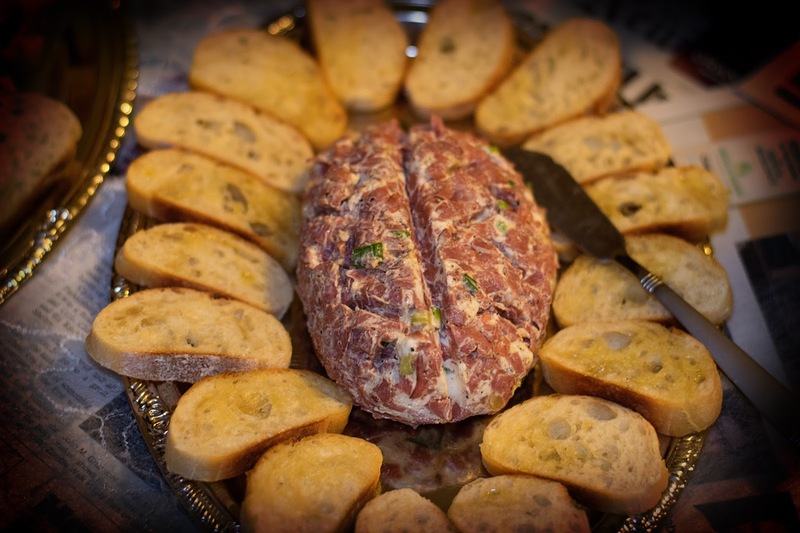 I am thinking about making your "Head Cheese"....only I don't know what Budding Beef is? Is it something only from Aldi? What could be an alternative?